THEY might be bright red in colour, but these new Target shopping bags are the greenest on the market. The certified biodegradable, compostable and reusable shopping bag has hit Target Ipswich and Redbank shops in an Australian first for eco-shopping technology. Target Australia spruiked the non-woven bag as an ideal alternative to regular enviro-bags, as they can be used up to 200 times like their traditional counterparts, before composting in 45 days under the right conditions. 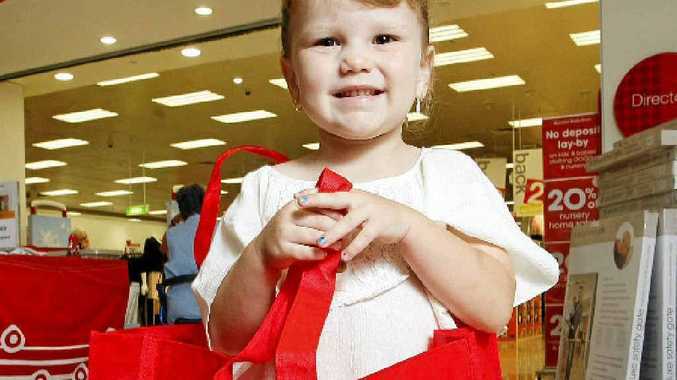 Target Australia's managing director Dene Rogers said the company was proud to be the first Australian retailer to offer the revolutionary bags to customers. "Most households these days have more than one reusable shopping bag that they use every day, however the beauty with this new bag is that when customers have finished with it, it will break down naturally under the right conditions within two months," Mr Rogers said. The bag was developed by Australian company Because We Care, following several years of research to ensure its durability. While traditional non-woven reusable bags actually take longer than a normal plastic bag to break down, Target's new red bags break down much faster. The large-size bags cost $2 each and all profits will be donated to The Allanah and Madeline Foundation to help provide essential items for children in emergency accommodation. The bag's release comes ahead of Clean Up Australia Day on Sunday, March 4, and may well reduce landfill in dumps across Australia.